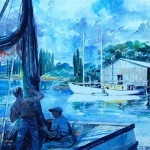 The St. Augustine Art Association Permanent Collection consists primarily of local subjects and is represented by well-known artists dating from the 1930s to the present. The works are displayed periodically in the Marguerita Phillips Wing, which was constructed in the 1990s thanks to the generosity of Faith and Joseph Tiberio. (A book of the entire Permanent Collection is available for viewing on site.) Traveling exhibits of works by noted artists and groups are also hosted in the gallery throughout the year. 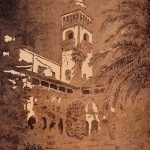 During the period of 1930-1950, in the midst of the Great Depression and outbreak of World War II, a dedicated group of professional and amateur artists who formed the St. Augustine Art Association (originally the St. Augustine Arts Club) helped transform the historic town of St. Augustine, Florida, into a thriving winter art colony that attracted hundreds of American artists, many from the northern art colonies of Rockport, Provincetown, Woodstock, Ogunquit and others. The work of these early/mid-century “Lost Colony” artists has been recognized as an important contribution to American regional art. 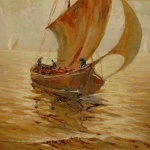 While the story of St. Augustine’s art colony is largely forgotten, this online gallery of selected works from the St. Augustine Art Association permanent collection offers an opportunity to connect with the artists and discover a remarkably unique and diverse aesthetic from years gone by. This online gallery and research project was sponsored by a grant from the JoAnn Crisp-Ellert Appreciation of the Arts in St. Augustine Fund through the Community Foundation of Jacksonville. Special thanks to Robert Torchia, author of Lost Colony: The Artists of St. Augustine 1930-1950. Rosalie Barclay; Walter Cole; Harold Etter; Emmett Fritz; Robert Hamilton; Ralph Hillbom; J. Courtenay Hunt; Louis Kronberg; W.F. Krondorf; William L’Engle; Tod Lindenmuth; Harold S. Maddocks; Gladys V. Mitchell; Heinrich Pfeiffer; John Pratten; Celia Gregor Reid; Lorena Rogers; Louise W. Shanks; E.B. Warren; Frances Howatt. Rosalie Barclay’s work as an artist places her historically within the 1940s Saint Augustine, Florida, Lost Colony. Like others in this group of mostly winter resident artists, she served actively on Arts Club (now known as the Saint Augustine Art Association) committees. A press release marked her attendance at the reopening of the Arts Club’s gallery, intermittently housed within the Hotel Alcazar. Barclay acted as hostess for the 500 guests who attended the exhibition. The gallery’s opening featured 68 works of art created by the Arts Club members. 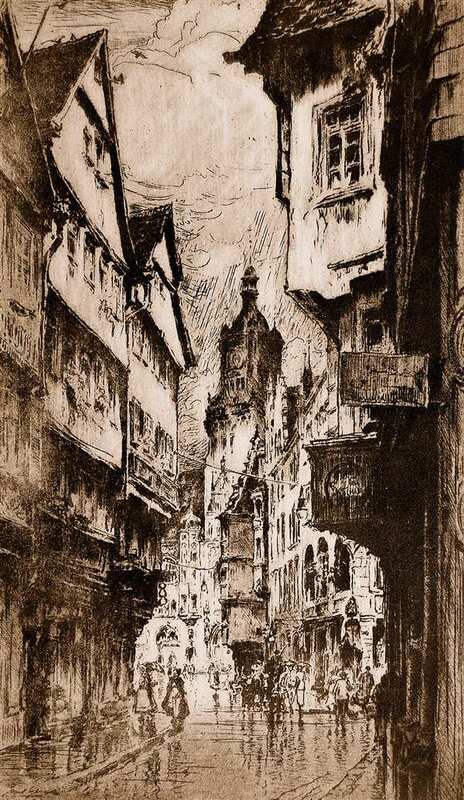 In this etching, Barclay forgoes extensive detailing to focus on the various textures of the buildings. The density of the lines in the shadowing creates a velvety blackness on street level that consequently draws the eye upward to the source of light. 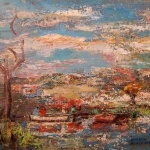 In 1951, she participated in a March exhibition at the Saint Augustine Art Association. Her piece titled “The Sawkill” was listed in the original catalog alongside works of fellow members H.S. Maddocks, E.B. Warren, Tod Lindenmuth, Gladys Mitchell, Celia Gregor Reid, Heinrich Pfeiffer and Hildegarde Muller-Uri. © All images owned and copyright protected by the St. Augustine Art Association. Reproductions for educational use by written permission of the St. Augustine Art Association only. Please contact info@staaa.org or 904.824.2310 to place a request. Walter Cole was a student of the Academie Julian and also of the Art Students League of New York under the teaching of modern artist Walter Kuhn. Cole lived and worked in New England and Florida; he was a winter resident of Saint Augustine. His style of painting was Realism/Representational; his subjects were marine and military in nature, in addition to portraiture. Cole’s works have been exhibited at the Pennsylvania Academy, the American Watercolor Society, the National Academy and the Institute of Graphic Arts. The community venues that exhibited Cole’s paintings were the Saint Augustine Art Association and the then-popular gallery, The Brush and Palette. This particular image of shrimp boats is quintessential North Florida. In the tradition of Realism, the subject matter is taken from the scenes and events of everyday life. Originally from Pennsylvania, Harold Etter was a member of the Saint Augustine Art Association, and one of the Lost Colony artists. 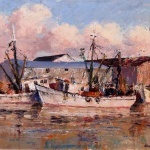 He worked in oils and watercolors, most often painting coastal landscapes. Though not well known outside of Saint Augustine, Florida, Etter taught classes in drawing and composition, and lectured on “Planning a Picture” at the Arts Club (now known as the Saint Augustine Art Association). 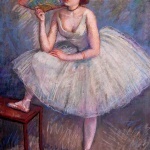 His Impressionistic style coincided with the new direction taken by the Arts Club in the 1940s. Robert Torchia states in Lost Colony: The Artists of St. Augustine, 1930-1950 that “the modernist faction’s influence [had] declined… as the Arts Club leadership became more conservative and the business community sought to attract more traditional artists to St. Augustine.” The Arts Club members tended to favor Impressionism and Regionalism. They found the landscapes and cityscapes appealed to the tourist market of Saint Augustine. 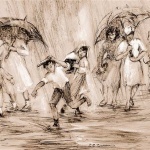 Emmett Fritz was born in Kansas City, Missouri, in 1917. He attended the Phoenix Art Institute in New York and graduated from the Pratt Institute of Art. Fritz began his career as a commercial artist. After serving in the Army during WWII, he became a cartoonist and caricaturist. Fritz had the opportunity to study under the iconic American illustrator Norman Rockwell through the correspondence course “Famous Artists.” Fritz was required to submit sketches, which were reviewed and critiqued by the instructor, Rockwell. 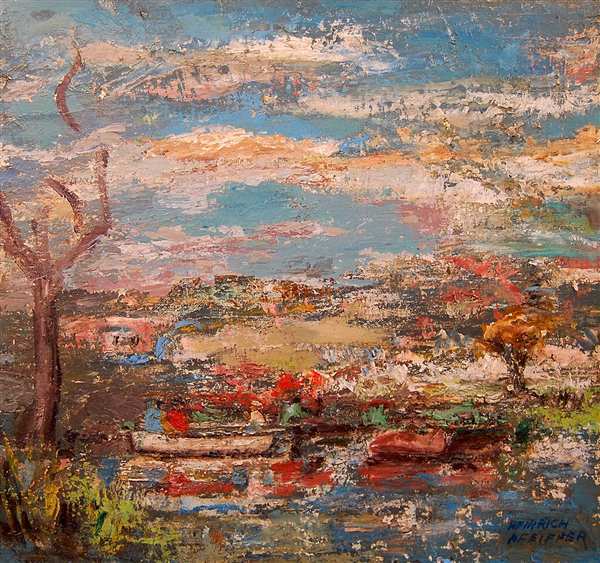 Around 1950, Fritz moved to Saint Augustine, Florida, joined the Saint Augustine Art Association and quickly became integrated into the artist community. Fritz painted in the Impressionist style. Using acrylics and oils, his subject matter was often the historic streets and landscapes of Saint Augustine. The artist operated a studio in the Riberia House on St. George Street where he personally greeted visitors who snatched up his affordable, colorful paintings. Over his forty-five year career in Saint Augustine, Fritz amazingly produced some 10,000 paintings. Watercolorist Robert Hamilton began his art studies at the Art Students League and then continued at the National Academy of Design. He relocated to Saint Augustine, Florida, in 1925, where he joined the Arts Club (now known as the Saint Augustine Art Association). He frequently exhibited paintings at the Art Association, where he established a reputation as a popular artist. Hamilton was elected to serve as its president for a term in the 1930s. The artist provided the sketched illustrations for a guidebook to Florida, which served to promote tourism through its artistic events and activities. Public records indicate he was employed as a commercial artist for The Record, the Saint Augustine newspaper. Ralph Hillbom was employed as a commercial artist for the Saint Augustine, Florida, local daily newspaper The Record. 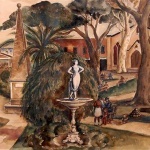 In the 1920s, Hillbom settled in Florida, and through the Arts Club (now known as the Saint Augustine Art Association), produced and promoted art. He has the distinction of serving as the Saint Augustine Arts Club’s first president, beginning his term in late 1931. Earlier in his career, Hillbom had been associated with the Woodstock artists. He painted the landscapes of Monhegan Island off the coast of Maine with other Woodstock artists, such as Walter Koeniger. The Woodstock community was regarded as a source of high-quality art during the decade of the Great Depression. His painting style was Realistic and Representational. The subject of his oils was most often natural inland or coastal scenery. Hillbom’s work is also represented in the Lightner Museum, a collection that showcases the works of America’s Gilded Age. 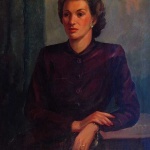 Frances (Franny) Howatt first trained in art at the Chaffee School For Girls under Madame Cheruy in her hometown of Windsor, Connecticut. She continued her studies as a pupil of Umberto Romano of the Umberto Romano School of Art in Gloucestor, Massachusetts. 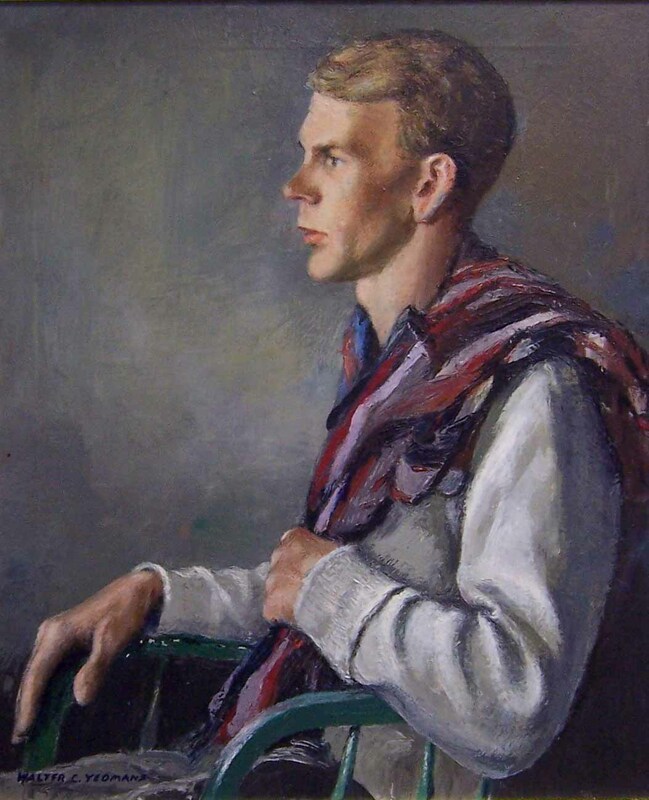 In 1946 Howatt relocated to Saint Augustine, Florida, and became the student of John Pratten, formerly of Elizabethtown, New York, studying portraiture under him for three years. 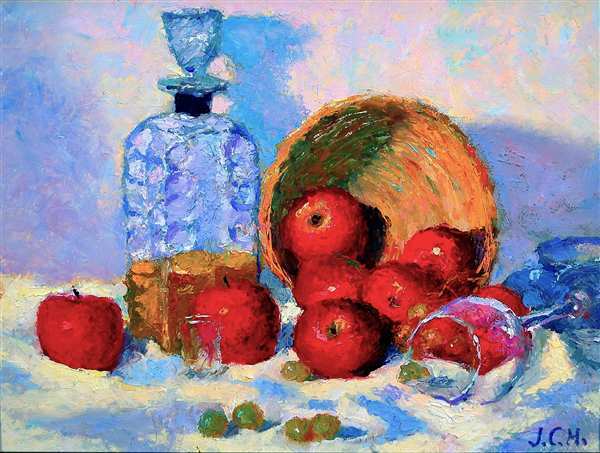 She received still life and landscape instruction from Charles Johnston. The scenes of Saint Augustine appear in many of her paintings. In 1962, Howatt was credited with developing a new painting technique she tagged “intalgios in oil.” This process involved a combination of carving and painting. Howatt distressed wood panels by gouging and scraping with chisels. The rough surfaces were painted complementary to the designs created in the panels. The works were suitable for interior or exterior and most had historical or literary themes. 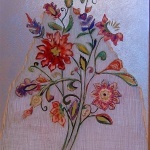 Howatt was invited to show her intalgios in an invitational exhibit at the Lillian Phipps Gallery in Palm Beach, Florida. An ardent supporter of the Saint Augustine Arts Club, Howatt and artist Tod Lindenmuth were members of the council that sponsored the first Arts and Crafts Festival in 1966. The festival’s mission was to foster the growth and development of the arts in Saint Augustine by providing a reciprocal exhibition to the public. The Arts and Crafts Festival continues to be a major event sponsored biannually by the Saint Augustine Art Association. J. 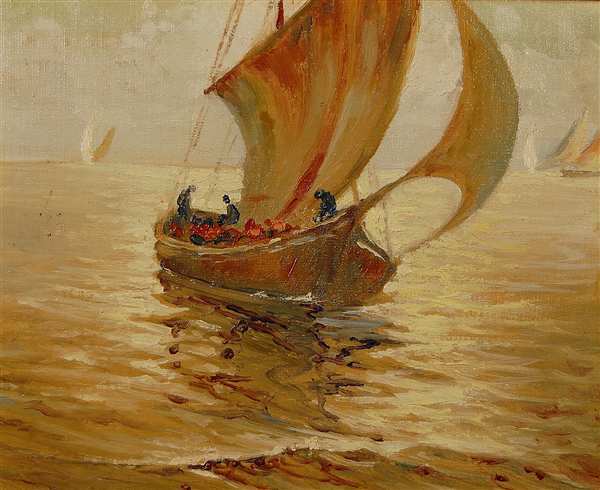 (Julian) Courtenay Hunt was a versatile artist who worked in oils, pen and ink and pastels. His works include portraits, still lifes and landscapes. His color palette often explored the vivid shades of purple and red, as exemplified in this oil painting. Hunt received his art education at the Ringling College of Art and Design and art training under Jerry Farnsworth in Cape Cod. Hunt exhibited one-man shows at the Palm Beach Gallery and at the Cummer Museum of Art and Gardens in Jacksonville, Florida. He contributed to shows at the Norton Gallery in Palm Beach, the National Academy Gallery in New York and the Society of the Four Arts in Palm Beach, Florida. 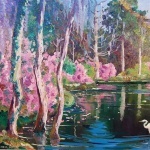 Hunt has pieces in the collection of the University of Florida and the Jacksonville Historical Society. The artist was also commissioned to paint a portrait of Andrew Jackson for the Jacksonville City Hall. Bostonian Louis Kronberg studied art at the School of the Museum of Fine Arts in Boston and the Art Students League in New York. He spent much of his career in France, purchasing art for Isabella Stewart Gardner of the Gardner Museum in Boston. Upon returning to the States, he became a prominent artist in Cape Ann, Massachusetts. One can’t help but surmise that Kronberg visited the exhibits of Frenchman Edgar Degas. 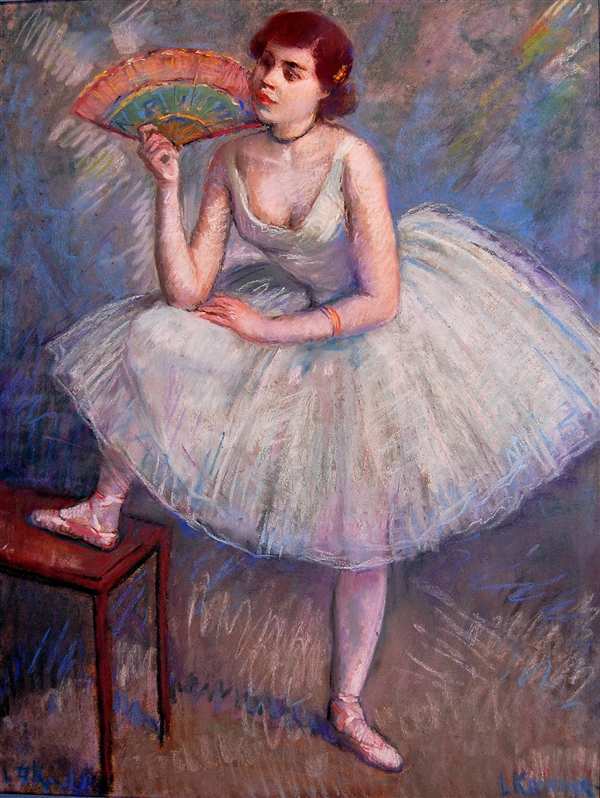 This pastel draws direct comparisons to Degas’ Ballet series in both style and subject matter. W. F. Krondorf was a German-American artist who studied commercial art, photography and lithography at the Art Students League in New York. In the early 1900s, he had a photoengraving business in New York, where he produced copies of famous paintings. 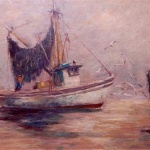 In the 1920s, Krondorf retired, moved to Saint Augustine, Florida, and became a member of the Saint Augustine artist colony. 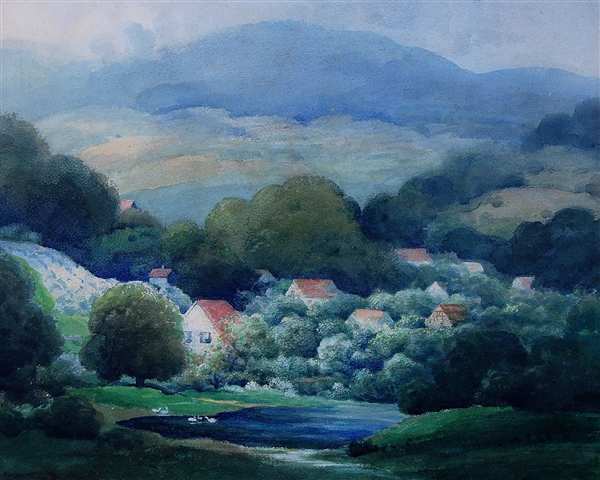 Krondorf is best known for his landscape watercolors, which are often dominated with muted hues of blues and greens. 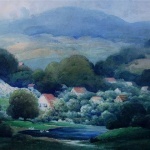 “Hills of Home” likely represents the countryside of Hessen, Germany, where he died in 1968. His work is also in the collection of the Cummer Museum of Art and Gardens in Jacksonville, Florida. William L’Engle was born in Jacksonville, Florida, and educated at Yale University in naval architecture. He spent the years 1906-1914 in Paris studying at the prestigious Academie Julien and the Ecole des Beaux Arts. During these years, L’Engle met and married affluent Lucy Steele Brown. The onset of WWI forced a return to the United States, and the L’Engles settled in New York City. They lead a privileged lifestyle, pursuing the arts and summering in Provincetown, Massachusetts. The L’Engles were active members of the Provincetown Art Association and served on the jury for its “First Modernistic Exhibition” in 1927. William L’Engle exhibited his work in New York City galleries and at the New York World’s Fair Exhibition. In 1940, the L’Engle family began to winter in Saint Augustine, Florida, where their friend artist Tod Lindenmuth had relocated. William and Lucy L’Engle joined the Arts Club (now known as the Saint Augustine Art Association) and served as promoters of the avant-garde art movement. The watercolor “The Market Place” represents a square in the center of Saint Augustine, the Plaza de la Constitution, which is the oldest public square in the United States. The artist Raphael Leroy “Tod” Lindenmuth was originally from Allentown, Pennsylvania. He was a student of Ashcan artist Robert Henri at the New York School of Art. Through Henri, Lindenmuth was exposed to urban realism, but his style was influenced by Impressionism and the folk art of Pennsylvania as well. 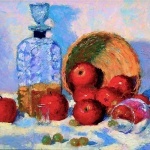 Throughout Lindenmuth’s career, his oil paintings and color woodblock prints were widely exhibited, and his art became nationally recognized. Both Lindenmuth and Warren were active members of the Saint Augustine Art Association and were made honorary lifetime members in recognition of their support spanning forty years. 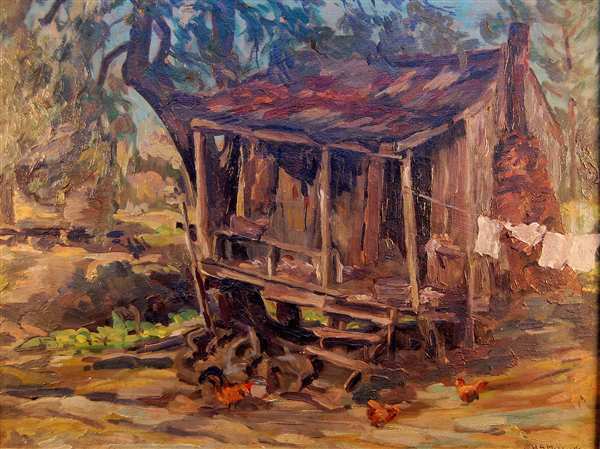 Harold S. Maddocks’ oil painting of Spuds represents a small potato-farming community west of Saint Augustine, Florida. The artist was a landscape and seascape painter who worked in the conservative Impressionist style. Born in Gloucester, Massachusetts, Maddocks was educated at the Massachusetts Normal School in Boston. 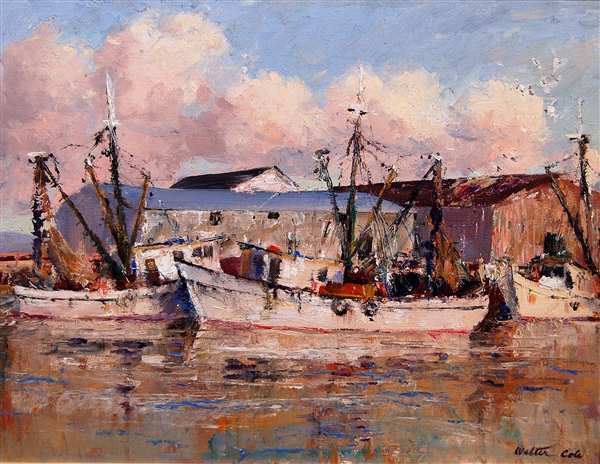 Maddocks was an active member of both the Rockport Art Association and the Saint Augustine Arts Club. 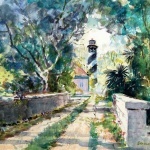 The artist offered weekly outdoor sketch classes at the Arts Club (now known as the Saint Augustine Art Association). Gladys V. Mitchell was born in Albuquerque, New Mexico, and was a member of the Santa Fe Artist Colony. She is best known for her Modernist landscape paintings of pueblos and figurative paintings of Native Americans. She worked in oil, watercolor and woodcut/woodblock. Mitchell experimented with material, color and texture. She painted with a vivid palette and began to introduce sand into her oils. 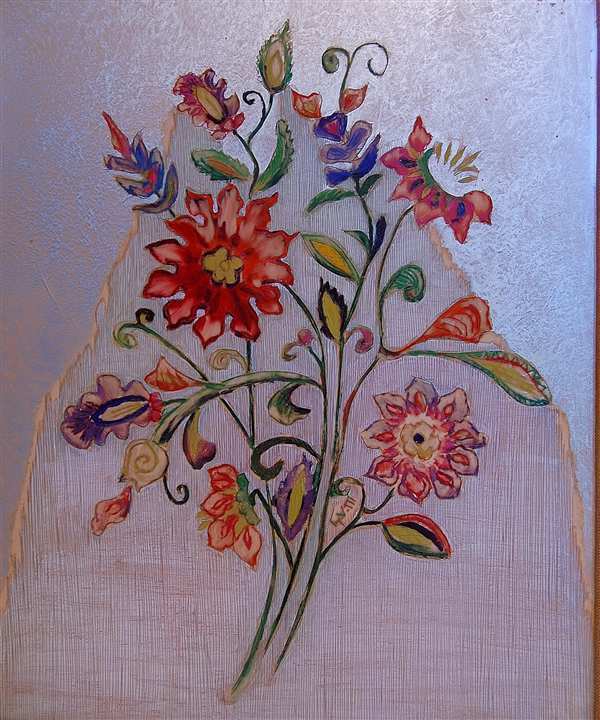 This still life is printed from etched lucite. Unlike etching on traditional materials like copper, etching on lucite creates a strong textural effect; the image appears almost embossed. While a resident of Saint Augustine, Florida, Mitchell molded plastics into jewelry, which she sold from her home on Charlotte Street in the historic downtown. Heinrich Pfeiffer was born in Pennsylvania and studied at the Art Students League of New York with traditional landscape painter John Carlson. He continued his studies at the Pennsylvania Academy of Fine Arts. Pfeiffer is best known for his colorful landscapes and coastal views painted in an Impressionist style. Pfeiffer maintained a strong presence in both the Florida and Provincetown, Massachusetts, art communities. 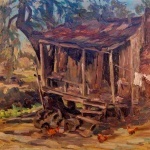 The winters were spent in temperate Saint Augustine, Florida, where the artist worked from his studio located within the Old Fatio House garden in the historic downtown. 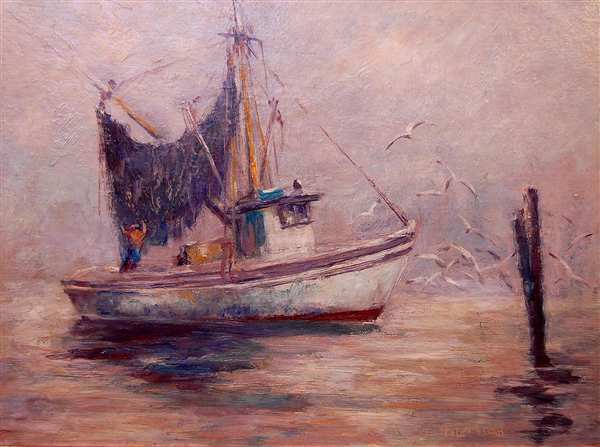 Later in life, Pfeiffer offered outdoor oil and watercolor painting instruction at the Norton Art School in Palm Beach, Florida. John Pratten was a college professor and painter whose work decorates the Sea World entrance in Orlando, Florida. He married Daisy Bruce in 1924, and they settled in Poughkeepsie, New York. The Prattens were very active supporters of the Duchess County Art Association in New York. John Pratten created display advertising and taught portrait and landscape painting. During the 1940s and 50s, the couple managed the Wayman Adams summer art school in Elizabethtown, New York. The Prattens later moved to Saint Augustine, Florida, where John conducted art classes (which were attended by the painting’s model Frances Howatt) and was active in the city’s Art Association. Pratten served on the jury of many competitive shows held at the Association. Throughout his career, he garnered many awards for his excellence in portraiture. In 1955, he authored the book Portrait Painting for Beginners. This painter and printmaker from Springfield, Kentucky, was trained in the United Kingdom and later studied at the Art Institute of Chicago, the Carnegie Institute and the Maryland Art Institute. 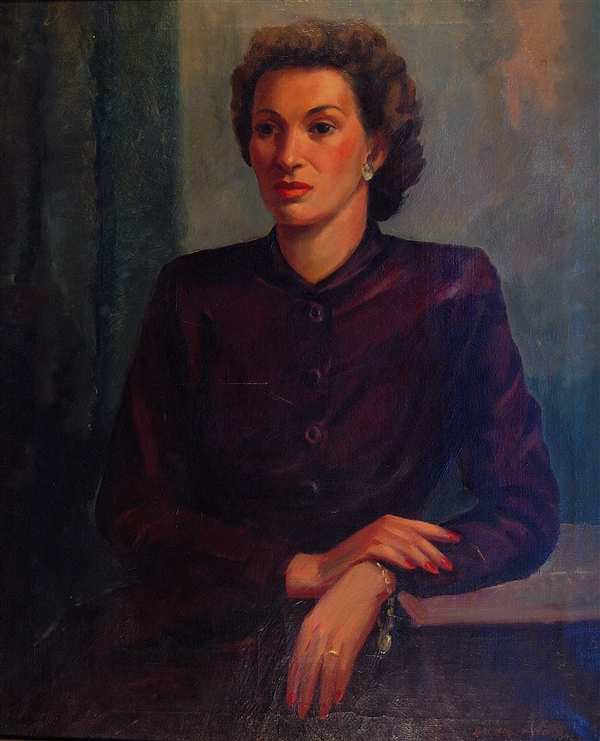 In 1926, Celia Gregor Reid moved to Saint Augustine, Florida, and became one of the leading members of the art colony. 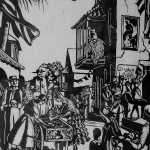 Beginning in 1935, Reid contributed her artistic talents to the production of the Saint Augustine street festivals. 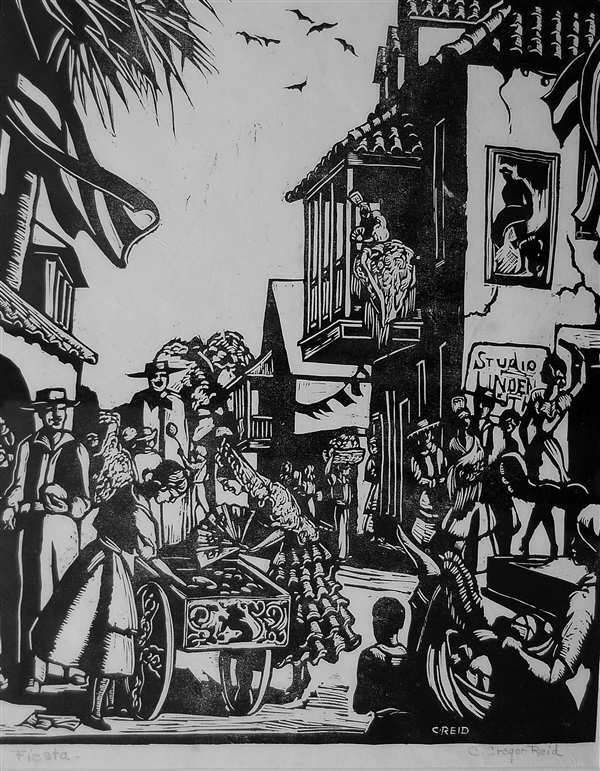 This particular print commemorates the Aviles Street Festival held March 19-20, 1948. The theme of the festival was a “Day in Spain.” Reid served as the chairman of festival design and decoration. In creating this blockprint, Reid placed the emphasis on surface design and patterns. The effect is a strong contrast of black and white. Reid offered this print to artist Tod Lindenmuth as a souvenir of the event. The Lindenmuths later donated “Fiesta” to the Saint Augustine Art Association to add to its permanent collection. Lorana Rogers was a scholarly artist. She studied at the Pratt Institute of New York, New York University, Columbia University and Cornell University. Until her retirement, Rogers spent twenty-five years as an art teacher in the New York City public schools. The artist exhibited her work at her studio in Alcott, New York. 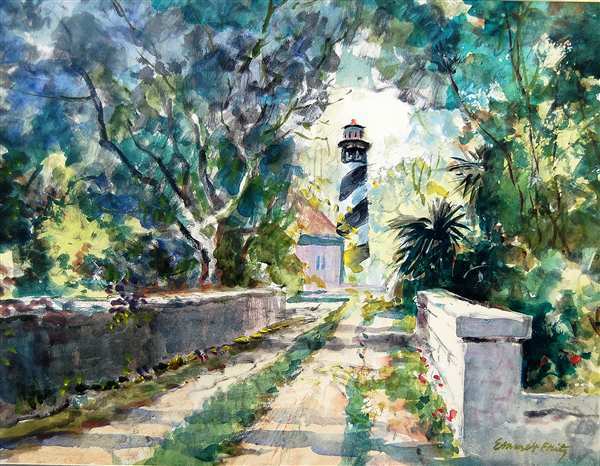 As a winter resident of Saint Augustine, Florida, Rogers was a member of the Saint Augustine Art Association and offered watercolor painting classes while in town. 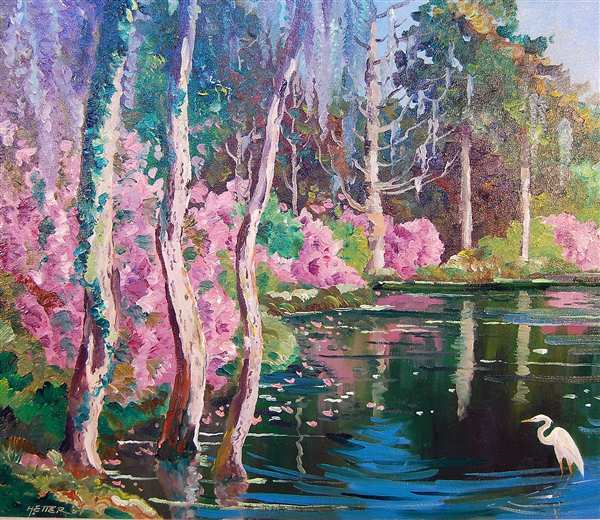 She exhibited her works at The Brush and Palette gallery, alongside other Lost Colony artists such as Tod Lindenmuth, William L’Engle and E.B. Warren. 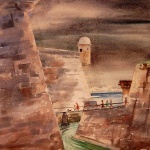 The Spanish coquina fort (Castillo de San Marcos) was a favored spot for the Lost Colony artists’ plein air excursions. Louise W. Shanks was born in Massachusetts and schooled in New England. 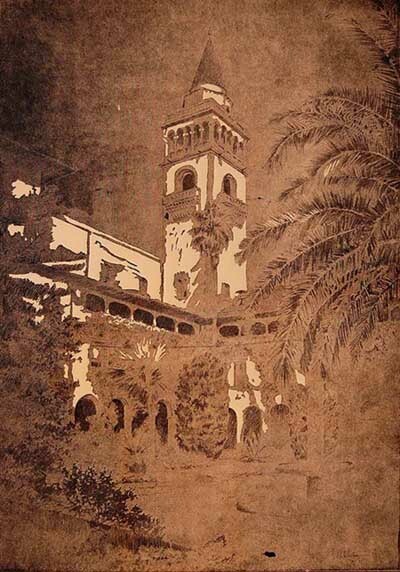 Shortly after the premature death of her husband, she moved to Saint Augustine, Florida and became a member of the Saint Augustine artist colony. Shanks worked in oils and is notable for her landscape and figurative paintings. She was a Representational artist until the 1940s, when she joined the Modernist faction of the Saint Augustine Arts Club (now known as the Saint Augustine Art Association), along with fellow local artists William L’Engle and Tod Lindenmuth. 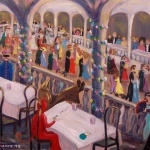 The “Bal Masque” represents the first annual Beaux Art Ball, held in the Lightner Museum in 1949. The event was sponsored by the Association to raise money for its building fund. 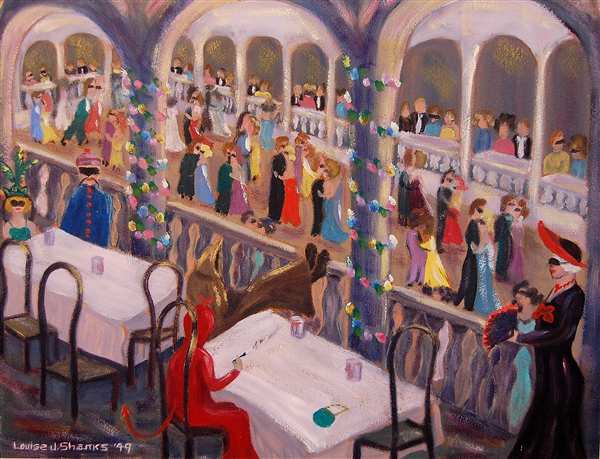 The theme of the ball was “A Night in Fairyland.” The figure in the red suit in the foreground won the prize for “most amusing costume” for her rendition of the Devil’s wife. This painting of Shanks’ is featured on the cover of Robert Torchia’s book Lost Colony: The Artists of St. Augustine, 1930-1950. Nunzio Vayana was born in Castelvetrano, Italy. He studied medicine and then art at the University of Rome. He immigrated to the United States in 1903, initially settling in Hartford, Connecticut. In the 1920s, Vayana founded the Ogunquit Art Center in Maine and served as its director for many years. Vayana made his debut in Saint Augustine, Florida, in 1932. Then-President of the Saint Augustine Arts Club, Ralph Hillbom extended an invitation for the artist to hold a private two-week exhibition. This exclusive showing was held in the Davenport Park Clubhouse and featured 100 of Vayana’s paintings. 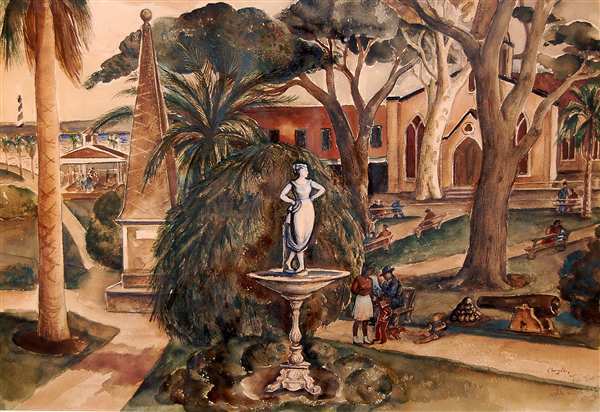 After the exhibition, Vayana continued to be relevant in Saint Augustine; however, his efforts were directed southward to Palm Beach, Florida, where he established the Palm Beach Art Center in the late 1930s. His intention for the art center was to provide assistance to other artists and a cultural outlet for the public. Throughout his prolific career, Vayana remained an Impressionist painter, working primarily in small scale. 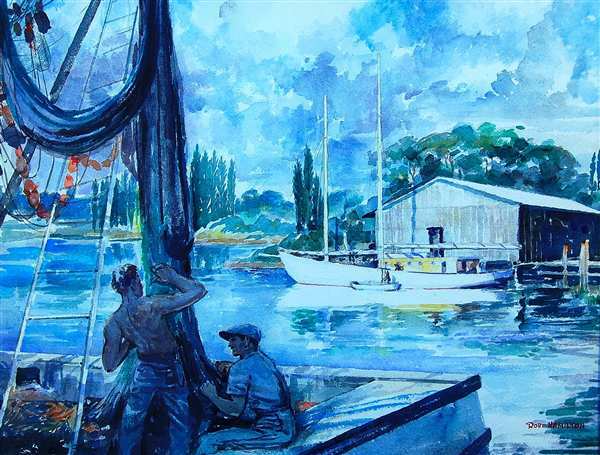 The images in his art are pleasant, idyllic marine scenes, landscapes and portraits. A tell-tale identifier of a Vayana painting is his signature, which appears in red paint. Vayana immersed himself in the art lifestyle as a painter, etcher, teacher, promoter and fine art collector. Elizabeth Boardman (E.B) Warren, artist and illustrator, was a student of the Massachusetts School of Art and the Vesper George’s School of Art. She was trained as an illustrator and etcher, but her early medium of choice was watercolor. 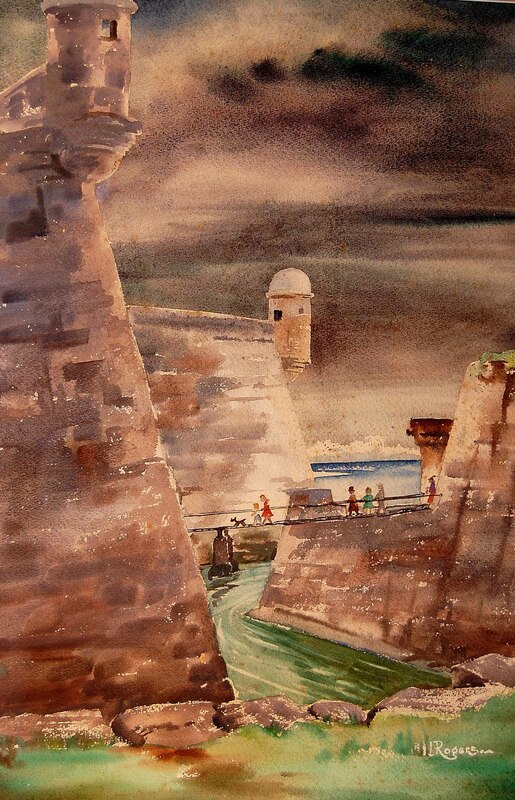 Warren created numerous watercolor views of New England and Florida. She and her husband, artist Tod Lindenmuth, were active members of the Provincetown Art Association and the Saint Augustine Art Association. 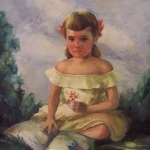 During the late 1930s, Warren began to paint pastel portraits of children. 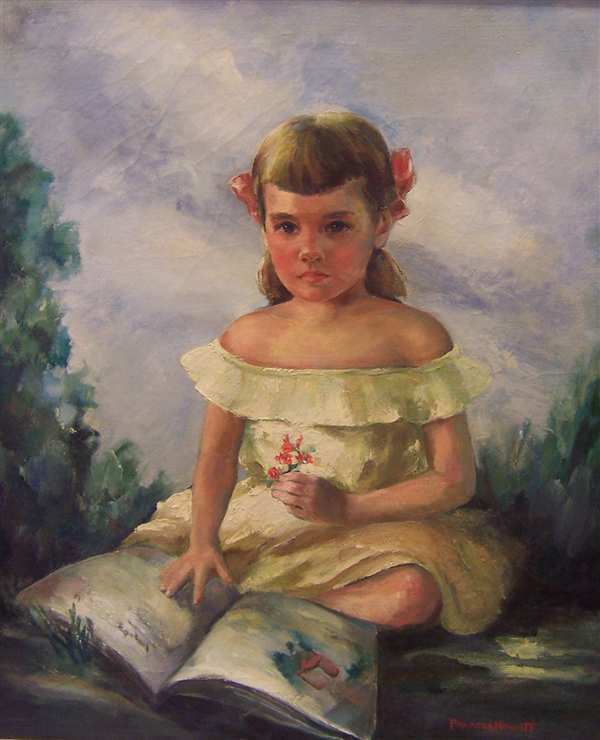 The artist became best known in Saint Augustine, Florida, for her exquisite pastel portraits of young girls. It was a “social must” to commission her for a portrait. These works were greatly treasured and became heirlooms within the families. 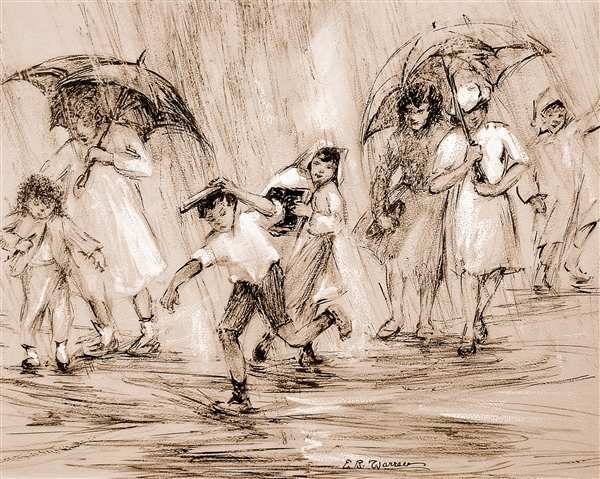 During her later years, Warren took up ink and brush drawing, etching and book illustration. 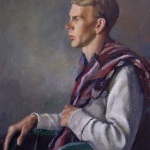 Walter C. Yeomans was an Illinois native and a student at the University of Illinois and the Art Institute of Chicago. Over his career, he worked as a printmaker, commercial artist, etcher and easel painter. Yeomans studied various art techniques under well-respected artists. 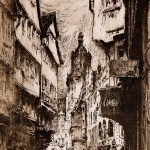 His etching skills were refined under the teachings of George Senseney and William Bicknell. Yeomans trained in landscape painting under American plein air painter Aldro Hibbard. In addition to this oil portrait, the Saint Augustine Art Association possesses colored and dry point etchings of Yeomans’. In the 1930s, Yoemans and his painter wife, Jane, became winter residents of Saint Augustine, Florida. The Art Association was fortunate in that the Yeomans became two of its most ardent supporters.